Been hitting up eBay a bit lately. When almost nightly you are forces to see Pirate Treasure Room's finds, Plaschke's Getzlaf collection, My Sports Obsession's free ebays, 30 Year Old's epic Dawson collection.... I could go on, but I think you get the point. The point is I am jealous. Not that I want those specific things (though I will make an exception on Jeff's White Sox cards) - I want stuuuuuuuuuuuuuuuuuuuff. So I got some stuff. Wanna see? That's two from the Archives White Sox autographs, and we have the Kittle on the way. Badda-bing. Badda-boom - done. That blue framed Duke....that is just too gorgeous, and only 101 pennies. I saw it and I had to make it mine, being a old timer fan. I believe, with shipping, there is $13 in that picture. This is one thick card. Seriously....it weighs a good ounce. 4+ cards thick. Crazy, I tell ya. 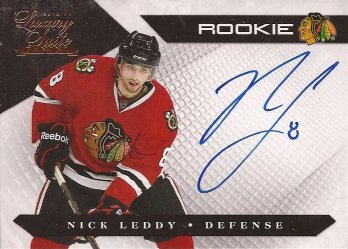 But a nice on card auto from someone that is slowly developing into a good second defensive pair member. This baby ran me $3.50 with shipping. Less than a blaster - 3 autos and a serialed. SWEET! Stay away from my White Sox cards on Ebay! I've been buying up vintage Sox cards lately trying to finish any vintage team sets. If you have the patience, Ebay isn't bad for getting cheap cards. I'm not sure how half the sellers stay in business when I can get cards cheaper than a stamp. But hey, who am I to judge.